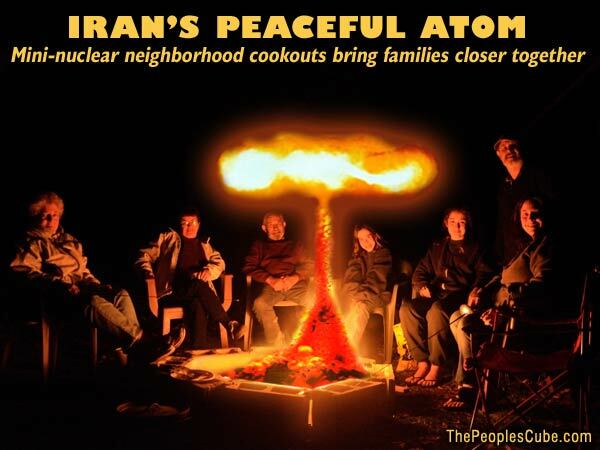 Today in Tehran various neighborhood groups practiced setting off miniature nuclear weapons in preparation for Iran's coming emergence onto the world scene as a nuclear power. When asked to comment about the apparently nation-wide exercise, one neighborhood leader responded simply "WE KEEL YOU!!!" Iranian Grand PBUH and Supreme Leader Ali Khamenei سید علی حسینی خامنهای was unavailable for comment, while President Mahmoud Ahmadinejad was observed standing in a beam of heavenly light and roasting kosher hot dogs over a mini-nuke in front of the Azadi Tower in Tehran. When asked the reason for the thousands of miniature nuclear explosions all over Iran, Ahmadinejad smirked and stated that the small mushroom clouds were simply for electricity. I had long been trying to patent and supply nuclear hand grenades for the Iranian National Guards. But the spontaneous manifestation of people's will in the form of blowing up nano-nukes in their own front yards is just as satisfying. It seems that Allah has heard my prayers. The glorious Mahdi is just around the corner! The glorious Mahdi is just around the corner! I suspect that he may arrive as early as Next Tuesday! Obama refuses to take a position on Iran's nuclear program, quotes Bible's "judge not" as authority. There is some continuation! What does Iran consider nuking? Is this what takes place between consenting male adults in private? The use of my image in the above graphic does not constitute my endorsement, or denial of the remarks made. Another non sequitur you say? Last edited by General Confusion on 2/23/2012, 3:44 pm, edited 1 time in total.